The Mayfield Park / Community Project is actively fundraising as we work with PARD on several large projects for the cottage and grounds at Mayfield Park. The rock wall is in need of major repair and an overall landscape plan is being developed. Financial help from the community is needed to help with long term community support of Mayfield. A summary of projects from 2016 is detailed on the News Update 2016 page. News Update: Congratulations! MP/CP is a 2016 Austin Parks Foundation grant awardee. This significant funding will help make progress on the rock wall restoration. Donations are needed to provide the community matching funds. 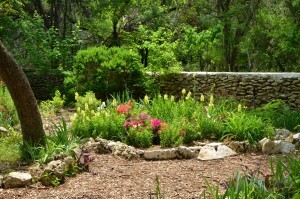 Thanks go out to Austin Parks Foundation and the many people working to restore Mayfield Park. Donations can be made through Austin Community Foundation. Two Mayfield Park funds are available, a Mayfield Park Community Projects Fund and a Mayfield Park Cottage and Gardens Endowment Fund. PROJECT – Rock Wall Restoration: In September 2015 the repair of the historic rock wall became a focus for the Mayfield Park/Community Project group. The historic rock wall restoration is a long term project that will span years. Your donations are appreciated! 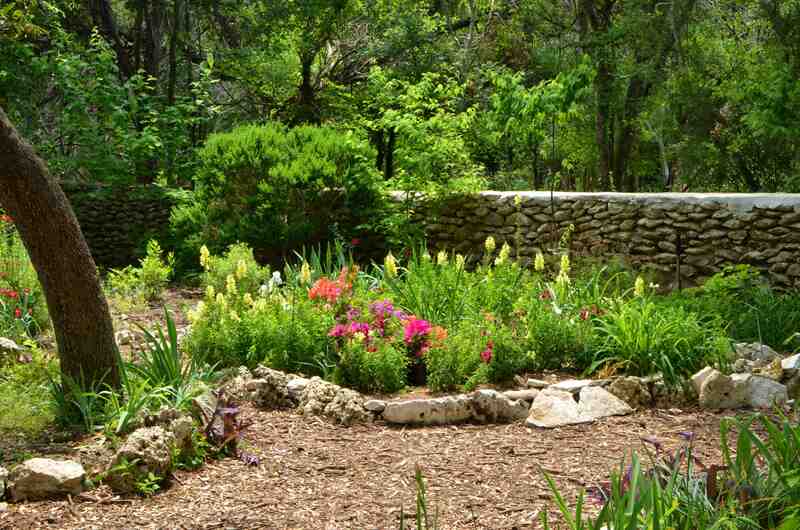 The Mayfield-Gutsch Cottage and Gardens are a registered City of Austin Historic Landmark and are also listed on the National Register of Historic Places. One of the defining features specifically called out in the National Register narrative of the cottage and garden grounds is the extensive rockwork evidenced in the surrounding rock walls, arches and gates. Through the passage of time, natural forces along with the deterioration of the rockwork’s structural integrity has resulted in the collapse of the walls in many areas. The mortar they used has not really held up well over time and it is failing in holding the stones apart in many areas. There are now exposed voids in the existing wall showing mainly sand left and little or no binding agent. The dominant use of small fieldstone to construct the walls adds to this inherent instability. This instability compounds the difficulty of repairing sections of the wall in that how the repair joins with and ties into the undamaged portion of the wall can be problematic. In the winter of 2014-2015 the deterioration of the garden’s southeastern perimeter wall became alarming and possibly posed an eminent danger to visitors to the park. In consultation with the City’s Parks & Recreation Department (PARD), and in acceptance of PARD budget constraints, it was decided that the park’s advocacy group, Mayfield Park/Community Project (MP/CP), would go forward and begin repairs on the wall with the expectation of either receiving additional private grant monies or doing the repairs in stages as funds on hand allowed. We applied for and received a Certificate of Appropriateness for the repairs from the Historic Landmark Commission (HLC). With an understanding from PARD, we contracted with the historic masonry group of Brian Ash, Ash Masonry Masterworks, to begin the repairs. While still considering these repairs of the southeastern rock wall to ultimately be one project, due to the emergency nature of the deterioration in the section of the wall closest to the southernmost column/gate, MP/CP has paid $15,000 of our funds to complete the first segment of repairs. MP/CP is also putting forward approximately $1,500 of our funds to pull back and take down the vegetation on the Mayfield Preserve side of the eastern rock wall that has contributed to the wall’s collapse. [NOTE: PARD told us that they could not undertake this forestry work at this time but we have received permits to have the work done by a private contractor.] We have begun actively seeking private funds to complete this project, and this grant will be used to continue this ongoing repair and rehabilitation of the historic rockwork that is now underway. If funding becomes available this is a fairly straightforward repair. The initial repair was completed in less than a month, and it is anticipated that all of the envisioned repairs could easily be finished within a similar time frame. Information about donations and community driven projects at Mayfield Park can be directed to either Blake Tollett blake.tollett@earthlink.net or Karen Cannatti neenok@aol.com.